This town is SO SMART! They see that the New Energy resource they have depended on up til now for their New Energy Boom must be protected -- so they are bringing in solar to compensate and keep growing. Gussing is the 1st EU town to cut its greenhouse gas (GHG) emissions by more than 90% and it is experiencing an economic boom from its commitment to New Energy. - Gussing’s transformation began 15 years ago (1992) when city hall, struggling to pay its electric bill, ordered the town’s move away from fossil fuels. Since then: 50 New Energy companies & 1,000+ jobs. - 1996: New Energy electricity to the whole town. Gussing, Austria, is in the region of what used to be the border between the Communist and Free worlds. 130 kilometers (80 miles) southeast of Vienna. A modern wood-to-energy furnace with emissions-containing fixtures. - Gussing: Population, 4000. Nickname: "Eco-Energy Land." Formerly agricultural (corn, sunflowers, timber). - New Energies developed in Gussing include: Solar, biomass and ethanol. Power generated: 22 megawatts/year. The 8 megawatts sold to national grid bring 4.7 million euros in revenue and 500,000 euros in profits spent on more New Energy infrastructure. 1st step: wood-burning power plant. 2nd step: plant for auto fuel from rapeseed. 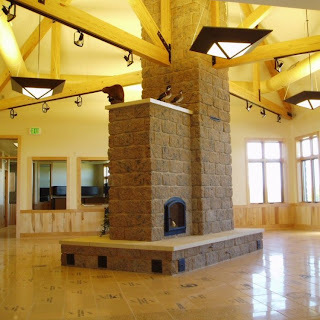 - The Hofbauer wood-to-natural gas process draws on local forests but cuts emissions and makes the town energy independent. Many worry about the forests. - Solon AG Fuer Solartechnik of Germany will finish a 50 million euro solar energy plant in 2008. - Hofer: "This was a dead-end town and now we're the center of attention…It seems like every week we read about new jobs from renewable energy." - Snoy: "The town is combining growth in tourism revenue with being in the vanguard of environmental sustainability…"
- Vadasz: "Just to turn to renewable energy brought advantages we didn't dream of before…A lot of money that left before, now stays in the region." - Raphael Rindler, local Franciscan priest: "People here take the forests for granted, the way people thought about oil 50 years ago…"
The challenges are real but so is the big money funding the scientists who are meeting the challenges as fast as a fluff piece like this can describe them. 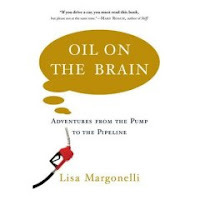 Interesting that this author considers natural gas/LNG to be "clean" energy. 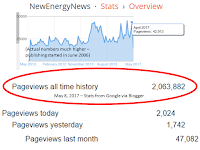 NewEnergyNews does not. Fossil-fuel is the most cost-effective energy for power plant electricity presently but a future in which alternatives are a significant part of the mix is foreseeable. Alternatives are expected to emerge following further research discovers ways to improve efficiency and lower costs. Placing alternative energies in the U.S. market is especially challenging because Americans expect nothing less than perfection of delivery. - Cleaner alternative energies still lack immediate viability in terms of cost and reliability but are cleaner and renewable. The complete mix of resources will provide a combination with which utilities can manage risk by having a portfolio of energy options. - Short term alternatives include renovating existing power plants to burn natural gas in a combined cycle so as to make use of the heat as well as the electricity generated. 2. Combined cycle plants reduce cost and emissions by including natural gas with denser, dirtier fossil fuels. 3. Solar energy will improve in cost but in places like Long Island where there is ample sun on big rooftops, it can already make sense. 4. Wind energy is expected to be cost effective as soon as turbine manufacturing capacity ramps up to meet demand. 5. Liquified Natural Gas (LNG) terminals may make natural gas more competitive but there is controversy over placement of the potentially dangerously explosive facilities. 6. 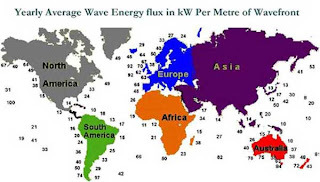 Wave-tide-current energies are still in the testing stages but represent enornmous potential. - Cordaro: "What it comes down to is what's cost effective and what's reliable, especially in this country when we've come to expect almost perfect reliability…"
- Gupta: "You manage your risk so you don't have to depend on any one source or cost…"
- Gupta: "[Solar energy] makes a lot of sense on Long Island, where there is so much sun and so many rooftops…A $30,000 system on a $1 million house is not a lot of money, and you can finance it like you would your roof. You pay for it over time." Whatever the challenges to New Energy, they don’t seem to be as serious as the challenges to Old Energy. 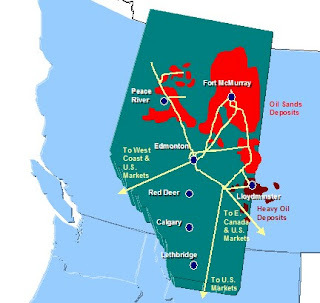 Are people finally realizing what it is going to cost to get those oil sands, long described as “another Saudi Arabia” in oil reserves, to produce useable oil? 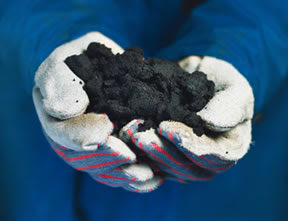 This is why they call it oil sands. Revenues for exploration rights in Alberta’s highly touted oil sands regions are down 60% for the year. Calculations are for exploration rights in oil, natural gas and oil sands. 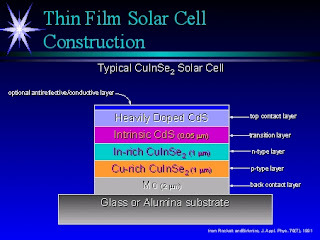 It is not entirely clear whether thin film solar is one of those technologies researchers are forever chasing but nevering making commercial, or whether it is THE solar technology solution. What is clear: If one of the many research teams around the country and around the world finds the secret formula to turn solar cells into a durable house paint or roof shingle at a high efficiency and an affordable price, they will get very rich very fast. The Durham team is pushing forward with research on “thin-layer” or “thin film” solar cells which is expected to make solar energy more affordable and accessible. Research has been ongoing for 4 years. - Durham University is a 175-year-old school in the city of Durham, in the northeast of England about halfway between Manchester and Edinburgh. - New materials being tried (copper indium diselenide, cadmium telluride) are more light-absorbing than current materials so it would take less to generate useable amounts of electricity. - Silicon-based photovoltaic cells are bigger, thicker and more expensive. - The new materials would allow the cell to be thinner and easier to build into a structure but so far have proven too inefficient to be practical. If perfected, they could spawn a new generation of Building Intergrated Photovoltaics (BIPV) producing cheaper,more easily installed solar energy systems. - Funding by Engineering and Physical Sciences Research Council (EPSRC). - Solar energy currently provides 1/100 of 1% of Britain’s electricity. - U.S. researchers like Nate Lewis of CalTech talk about advancing the technology to the point where it can be a roofing shingle or house paint. 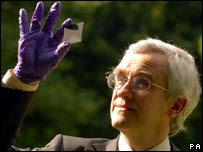 Professor Durose displays a small sample of his solar film. Durose: "One of the main issues in solar energy is the cost of materials and we recognise that the cost of solar cells is slowing down their uptake…If solar panels were cheap enough so you could buy a system off the shelf that provided even a fraction of your power needs you would do it, but that product isn't there at the moment." Congress will do daunting battle this fall over energy and climate change legislation. This issue will be fought out on the frontlines. Eileen Claussen, president, Pew Center on Global Climate Change; Judith Greenwald, director of innovative solutions, Pew Center. Claussen and Greenwald advocate for “cap-and-trade” over a “carbon tax” in anticipation of a debate in Congress over the best way to incentivize greenhouse gas (GHG) reductions. - With climate change ongoing, the U.S. Congress will finally confront the question this fall. - The EU system covers 10,000 emitters and a market with millions of credit trades monthly. But its earliest 2002 thru 2007 stage, named Phase 1, was bumpy, as it worked out the complexities of the process rather than focusing entirely on emissions reductions. This allowed detractors to condemn it. Phase 2 starts in 2008, allowing a “reset” moment. 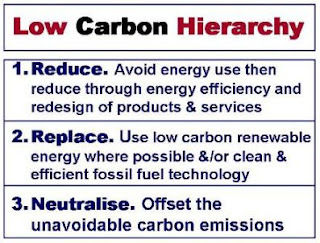 The system is exoected to emerge functioning more efficiently and incentivizing significant emissions reductions. No doubt new problems to be sorted out will present themselves. - The “carbon tax” would be a charge per ton of emissions. - The “cap-and-trade system” would begin with federally-established allowed emissions (credits) to each emitter. If the entity (business, factory, farm, etc.) goes over its limit, it pays a stiff fine. If it stays under its limit, it can sell its excess credits to over-emitters at much lower rates than the fine would be for the same excess emissions. This incentivizes entitities to find low-emission forms of energy and to find the most energy efficient ways to do whatever it does. - “Tax” advocates say it is simpler. They also claim the EU “cap-and-trade” system shows how bad such a system works. - Both systems require monitoring and enforcement. Both have complexities. Cap-and-trade needs working out the whole credits scheme and running a market for them. Tax requires working out redistribution of revenues. - Cap-and-trade is more market-based and more flexible. It can link internationally and stimulates “banking” of credits. - New taxes are hard to legislate, leaving legislators with the option of cap-and-trade or no anti-climate change measure. This is not the most important measure in this fall's anticipated Energy Bill fight, but it is worthy of attention. Rep. Jane Harman, D-Calif., author of legislation to ban the incandescent bulb; Royal Philips Electronics, manufacturer. Thomas Edison’s incandescent light bulb is far less efficient than the compact florescents lightbulbs (CFLs) now available. Switiching over to CFLs would save enormous amounts of electricity and stop equally enormous amounts of greenhouse gas (GHG) emissions produced for electricity to power them. This would save consumers much more than they will spend on the new CFLs. Rep. Harman proposes to legislate incandescents out of use. - Harman’s bill would stop the sale of incandescents after 2012. The legislation requires another step up in efficiency in 2020. - CFLs have been around a long time but have only eliminated negatives like poor light, noise and excessive toxins in the last decade. 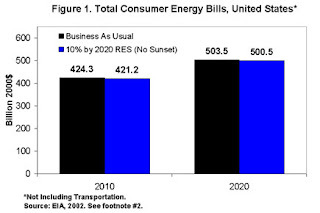 - 2012/14 requirements save consumers 30% on bills. 2020 requirements save consumers 75% on bills. England and Australia have already set phase-out dates for the incandescent. - The 2007 House energy bill includes Harman’s proposal. The Senate’s version does not. This is anther issue to be hammered out in the conference process next month. - If every U.S. home replaces one incandescent with one CFL, the country will save $600 million in energy costs. - Some opponents don’t want to make government “light bulb police” and others object to the quality of CFLs. Many think the bulbs will emerge w/o government action. 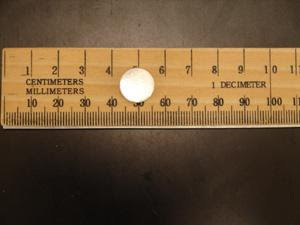 Lumens measure the brightness of the bulb. The House bill mandates an increase of lumens incandescents cannot meet without increasing wattage. Because they are more efficient, the CFLs can be brighter without using more electricity. - Halogen bulbs also meet the legislative standards and are improving. - LEDs will come into the picture as efficiency requirements rise. - CFLs contain mercury, a tiny fraction of what old thermometers had, but must be recycled. Call 1-877-EARTH911 or go to Earth 911 for more info. All IKEAs also take CFLs for recycling. - Harman: "Only 10% of the power used by today's incandescent bulbs is emitted as light, while the other 90% is released as heat…"
- Rep. Jay Inslee, D-Wash.: "By simply replacing the light bulbs in their homes, our constituents will be saving money in addition to energy…"
BLM OPENS GEOTHERMAL OPPORTUNITIES –TO WHO? Smart development of renewable resources is what it's all about. But who is bidding on these contracts? Any input from environmental groups? The recent Utah coal mine cave-in is a reminder: Federal watchdogs can sometimes be puppies to companies with deep pockets and heavy clout. BLM will do a programmatic environmental impact statement (PEIS) establishing where geothermal energy development would most effectively be conducted on federal lands with the least environmental harm. Leasing for development, if deemed feasible, would follow. - Intention to do the PEIS was published August 27. The public has 60 days to comment. - The Energy Policy Act of 2005 stipulated 90% of pending applications must be processed by August 8, 2010. - Federal lands w/high geothermal potential in 11 western states and Alaska as identified by BLM, U.S. Forest Service & U.S. Geological Survey. Especially noted: Northwestern Nevada, northeastern California, Oregon’s Raft River Basin. - This BLM move recognizes current demand for renewable energy sources. 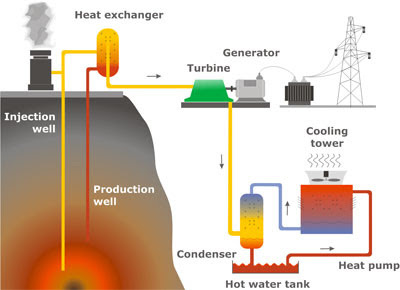 Geothermal energy uses hot water and steam from deep in the earth to heat buildings and greenhouses or grow plants as well as to drive electricity-producing generators. It is now 17% of U.S. renewables. 50% of present U.S. geothermal energy is generated on federal lands (mostly California and Nevada). 90% of potential U.S. geothermal energy is on federal lands. - PEIS analyzes best sites and steps in lease applications. BLM seeks public input on these issues as well as best practices for development of geothermal resources. Public meetings will be held in 10 western cities. - BLM expects 100+ applications, based on applications pending in 2005. 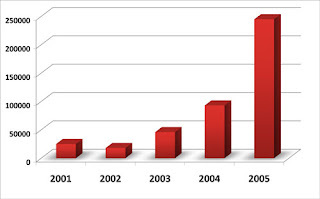 It issued 291 leases since 2001 but 25 between 1996 and 2001. - BLM currently administers 420 leases, 55 producing geothermal energy, 34 with power plants. What makes this story more than trivial is that Indian Point is thought to already be on terrorists’ radar because of its proximity to their favorite target, New York City. It has also had siren failures and radioactive water leaks. The unnamed federal inspector found the unnamed gate guard asleep on duty. It took 2 minutes to rouse the somnolent protector. The nap took place in the afternoon of a shift that began at 6 am. 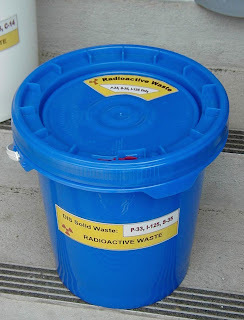 - The Indian Point facility is in Buchanan, NY, 35 miles north of New York City, on the Hudson River. 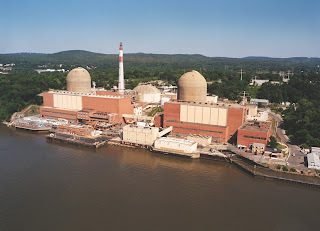 - The guard was asleep alone in the 2nd of 3 security rings around the 2 Indian Point plants. - Other security measures remained in place during the nap and tapes show there was no safety breach of the gate to the next ring where the reactors and spent-fuel pool are. Other measures to open the gate include the matching of a palm print and badge scan (in case any terrorists need to know). - The inspection was specifically targeting security on the “backshift” (night /weekend). - The guard, a 5-year veteran who carried a sidearm, was placed on administrative leave pending a review and drug/alcohol testing. Guards are rotated during shifts to counteract the tedium. Sheehan: ‘[There was no security breach] but that doesn't make it any less serious… [Entergy] needs to get to the bottom of this and make sure the staff knows this is unacceptable." The man who showed humans how to fly under their own power now soars in history. He was tactiturn yet funny, quiet yet articulate, gentle yet stronger than steel, reasonable yet firm of opinion, unconventional yet profoundly practical. Human-powered flight had long been considered theoretically possible. But nobody could figure out HOW. Paul did it. With one word: EFFICIENT. There is no doubt that Nature would stand up for Paul. He stood up for Nature. He loved the heights, be it soaring or hiking the San Gabriel Mountains above Pasadena. There was never a better champion of New Energy (or a better friend to NewEnergyNews). could cause carpal tunnel syndrome. What it comes down to is this: From the time he was a boy winning national acclaim building model airplanes, he got the most by keeping it simple. Paul died August 29, 2007, at his home in Pasadena. He was 81. - Paul was born September 29, 1925. He married Judy Leonard MacCready on May 18, 1957. They had three sons, Parker, Tyler and Marshall, and two grandchildren. 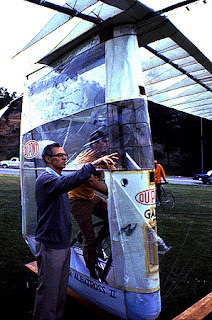 - On August 22, 1977, Paul’s entirely human-powered “Gossamer Condor” became the first aircraft ever to fly the course and distance required by the Kremer Prize as proof of “human-powered flight.” On June 12, 1979, his “Gossamer Albatross” flew over the English Channel entirely by human power. - AeroVironment was founded in the summer of 1971. It remains a leader in flight as well as cutting edge energy and transportation. Paul was born in New Haven, Connecticut. After putting in a brief stint training as a U.S. Navy pilot at the end of WWII, he completed his Bachelor’s Degree at Yale and migrated to Pasadena. He earned a Master’s Degree and Ph.D. from the California Institute of Technology (CalTech). - Paul began his professional career with efforts to change the weather. He ended it having changed the world. 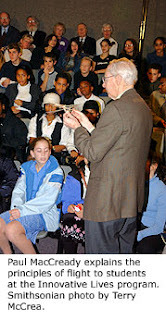 - His first company, started in 1958, was Atmospheric Research Group, a cutting edge venture that made research flights into the core of storms and experimented with cloud-seeding. 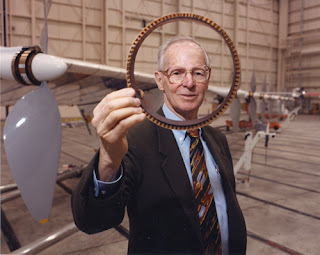 - Though he had long been engaged in soaring and gliding, his work with human-powered flight began seriously in 1976 when a large business debt caused him to notice the large cash award attached to the British Kremer Prize. All he had to do was figure out how to get a heavier-than-air craft off the ground to an elevation of at least 10 feet entirely under human power and fly a figure-eight course of at least a half-mile. 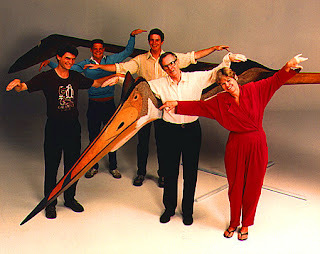 - While on a family vacation in 1976, he was studying the soaring habits of turkey vultures and explaining it to his sons when he realized the secret to human-powered flight. After consulting with colleagues on these unique insights, he gathered an intrepid crew of stalwart volunteers. The project he had optimistically estimated would take 6 weeks took a year. To do what nobody else ever did. - Paul was one of the first to recognize the implications of the 1970s oil and economic changes. 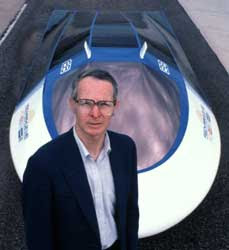 His insight made him a pioneer in solar-powered cars and airplanes, electric cars and efficiency. Aerovironment was the company charged with building the ill-fated electric car of the 1990s. Paul drove an electric car as long as he drove. 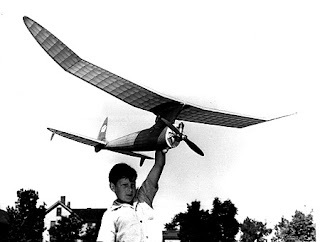 ...I remember a newsreel in, let's say, 1938, when I was 13 years old, that showed a sailplane flying over a slope at El Mirage…It was such a wonderful kind of flying. And I found that it was a wonderful, addicting hobby. ...I don't think of myself as especially competitive…If you are in a contest, there is always some motivation towards trying to win, but the real value is just entering in the competition. It will help when U.S. national leaders step up to their responsibilities and deal the country into the world emissions markets. But private "offsets" will still require independent assessment and the assessment will require standards and regulations. Right now, the offset marketplace is like an oil boom town -- wide open. In a potentially trillion-dollar market, there are not yet adequate standards and regulations governing “offsets.” Profiteers and scam artists are taking advantage of good intentions, as they usually do until controls emerge. Problems have existed since offsets were initiated and will continue to exist until adequate standards and regulations are established. - Demand for offsets is rising, though no certain and comprehensive statistics are available. EcoSystem Marketplace, a research firm, puts the increase in sellers at 200% or greater. - Popular online offsetters: Climate Trust, NativeEnergy, Terrapass. - Popular projects: wind farms, methane digesters. - Controversial project: planting/protecting trees. How much new trees offset is in doubt and whether the protected trees needed or got protection is not clear. - Clean Air-Cool Planet studied 30 offsetters for transparency and credibility. Only 8 scored above 5 (on a 1-to-10 scale). - Confusion arises even over legitimate offsets as between Terrapass.and Gallo Farms. - California Climate Action Registry is trying to establish state standards. 1. Are the offsets certified (Voluntary Carbon Standard, the California Climate Action Registry's offset protocols, Climate Community and Biodiversity Standard)? If not, why? 2. Is there proof the offset is sold only once? Is the transaction is registered? 3. Is there proof the offset adds GHG emission reductions? 4. Is there proof the project is verified and measured by an independent onsite auditor? - Julia Bovey, spokeswoman, Natural Resources Defense Council: "Right now the status is buyer beware…There are a lot of companies out there . . . but there are concerns that have to do with whether the money is going to where they say it is going." 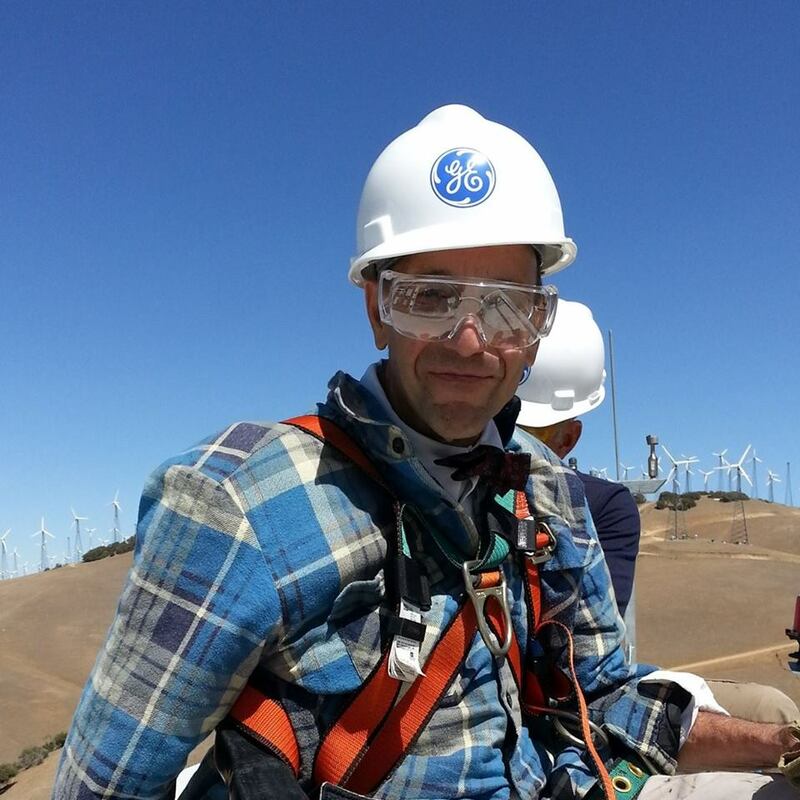 - Robert Parkhurst, manager of PG&E's Climate Smart: "There are so many different programs out there that are doing this…You really have to dig down." - Derik Broekhoff, senior associate, World Resources Institute: "Unfortunately, it's perfectly easy for the buyer and seller in the transaction to be perfectly happy and yet it's the atmosphere that could get the short end of the stick…"
- Ricardo Bayon, managing director, Ecosystem Marketplace: "Right now the voluntary market is in a very chaotic disaggregated phase of development, one that is changing rapidly…Standards are emerging, and it is only a matter of time until we have credible third parties certifying offsets and doing so in a way that allows consumers to have a reasonable assurance that the credits they are buying do truly reduce emissions." 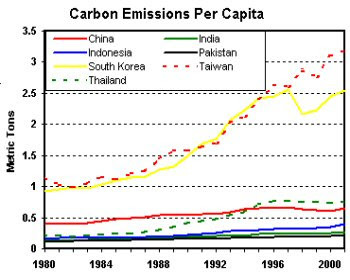 The South Koreans decided it was time to take advantage of the opportunities emerging in emissions trading. It does good by climate change, too, of course, and is, thus, that rare and wonderful convergence of something profitable that does the world good. Maybe the U.S., China and India should give it some thought. 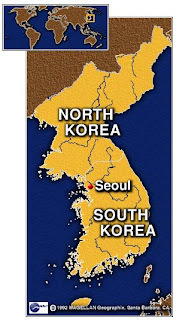 South Korea will move to reduce domestic greenhouse gas (GHG) emissions by establishing a domestic emissions market. It has approved 50 projects and will issue credits to the owners of those projects for auction to utilities who have failed to generate energy from renewables at government-established requirements. - Announcement made August 22. Market will be in place by the end of 2007. - The plan is based on the Kyoto Protocols, which began in 1997 and run through 2012. The market described will be a South Korean domestic market though if projects meet Kyoto standards they may be sold in the EU ETS or other markets as Certified Emissions Reductions (CERs). - By purchasing the government-approved credits from renewable energy projects, the utilities will be offsetting their investment failures in renewable energy when purchasing power. The market is thereby expected to spur development of renewables. - The government guarantees to buy any credits not sold to utilities at KRW5,000 (US$5.30)/metric ton. - South Korea, the world’s 10th-biggest GHG emitter, is not bound by Kyoto Protocol limits but it has been urged by International Energy Agency (IEA) Executive Director Claude Mandil to move on the issue. 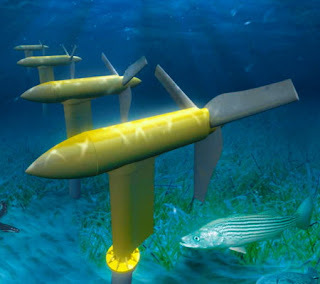 A little-mentioned exciting aspect of wave energy is that it can be a self-powering water desalination system while it generates emission-free, predictable, renewable power. Another is that much of the industry that supports wave-tide-current turbines also supports wind turbines, making the two energies synergistic. Malcolm Spaulding, professor of ocean engineering, University of Rhode Island/Graduate School of Oceanography; Verdant Power; Oceanlinx (John Bell, CFO); Federal Energy Regulatory Commission (FERC). Wave energy is more than the wave of the future. 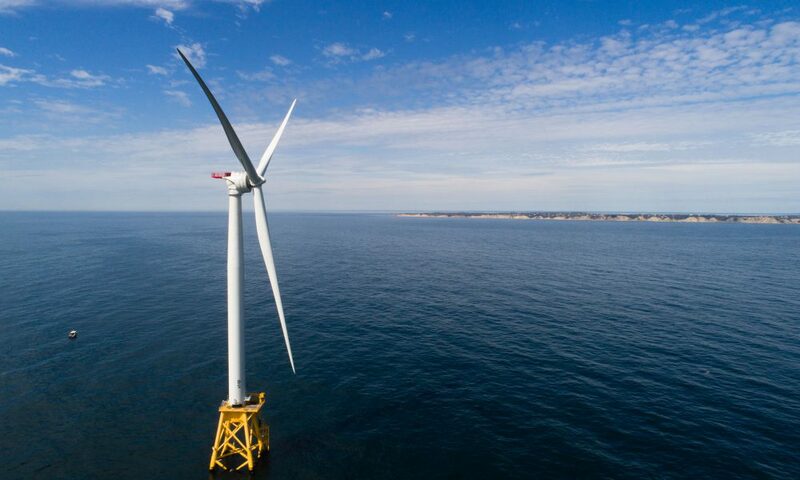 Ongoing research and new ocean tests approved by FERC are bringing the energy source along. Wave energy viability is, if not eminent, certainly foreseeable. - Verdant Power is Canadian-American and has a test project in New York City’s East River. Oceanlinx is Australian and has a test project off Port Kembla, Australia. - Other test projects: Vineyard Sound in Massachusetts, the Atlantic coast of Florida, San Francisco Bay, Washington’s Puget Sound and waterways along Alaska, Maine and Oregon, Hawaii and the UK. - Spaulding’s research is the study of the oscillations on waves of a triangular buoy of PVC pipes containing magnetic generators. The movement generates electricity which is captured and measured. The model generates 0.2 watts from big waves in the experimental wave tank. A full-scale model (32.8-foot pipes) will generate much more. - FERC has approved 45 U.S. test sites and 15 are pending. 6 are in Long Island Sound. The type of Verdant turbine now placed in the East River of NYC. - Spaulding: "The idea is to get the design so the more 'heave' we get, the better…"
- Bell: "There is no fuel cost in that the wave activity is there…It's low visual impact. In our experience, so far, these devices are attractive to marine life. There's no noise generated. There are no moving parts about it." 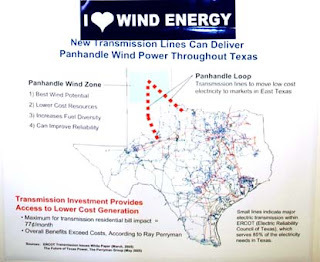 The article mentions that Pickens, who is independently wealthy, finds wind turbines ugly whereas less financially blessed neighboring Panhandle ranchers say the turbines look as pretty as money to them. 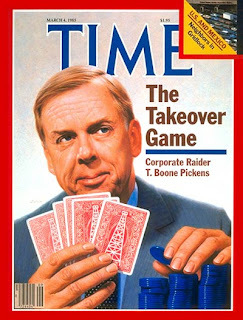 Boone Pickens is a tough negotiator and a good guy to have on wind energy's side of the table. Mesa has begun signing up landowners at $4/acre upfront for participation in a proposed 4000-megawatt wind farm in Gray County. Landowners royalties could range from $50,000 to $80,000/yr, depending on wind and participation. 1000 new jobs from wind are expected, more from associated projects. - Pickens was in Pampa, Texas, August 23, negotiating leases. - Regulatory approval of the project is hoped for in 2009, allowing construction in 2010. Pickens Pampa appearance was in the Heritage Room of the M.K. Brown Civic Center. Pickens owns a ranch in neighboring Roberts Count. Mesa Energy is based in Dallas. - This will be the world’s largest wind farm, five times bigger than the next biggest, a 735-megawatt installation in Abilene. 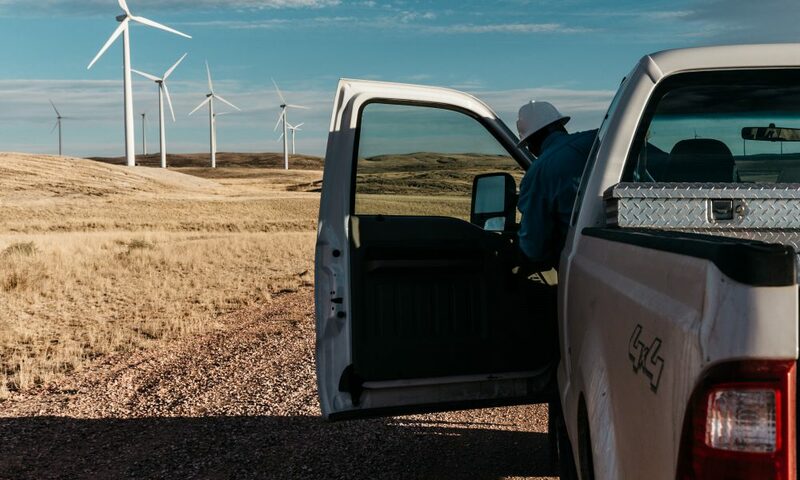 - In addition to the wind installation, Mesa will build 320 miles of transmission lines to serve the rapidly expanding Dallas metropolitan area as well a supplemental 750-megawatt coal-fired plant and a peak demand 600-megawatt natural gas plant. The 5000+ megawatt undertaking is expected to cost $10.5 billion. 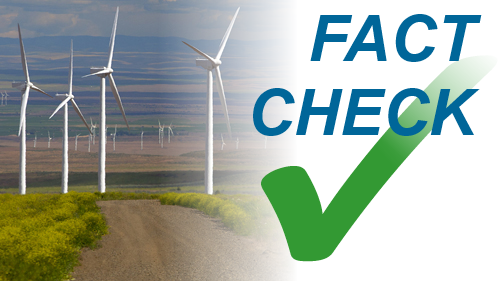 - Income to the landowners cannot begin util the installation and transmission lines are complete. Friedrich infuriated VW executives by showing Golf emissions could be cut 25% without cutting horsepower. In public statements, Friedrich was especially disdainful of alternative fuel vehicles such as the hydrogen fuel cell. - 1997: German Chancellor Angela Merkel, as environment minister, had list of environmental officials too outspoken to speak in public. Friedrich was Number One. - 2012: EU requires vehicle emissions to be 120 grams. - July 2007: German car makers petition EU for extension, saying it will be impossible to meet the requirement. Friedrich’s efficient Golf demonstrates emissions of 131 grams. VW announces a new diesel Golf that will meet 120 gram standard. Mercedes Benz and BMW announce they will show cars next year with several of Friedrich’s modifications and lower emissions. - The California Air Resources Board (CARB) sought out Friedrich’s opinion on controlling emissions. - EU hearings were in Brussels. - Friedrich’s Golf modifications were low tech (see illustration). - VW contends the car may be more efficient in the lab but cannot be competitive and safe. - These issues are especially contentious in Germany where 1 of 7 jobs is auto industry-dependent. - German car companies have done a lot of research with the hydrogen fuel cell despite a rather obvious absence of answers to questions such as “Where will the hydrogen filling stations come from?” Friedrich, once an enthusiast of hydrogen fuel cell vehicles, now disdains them. 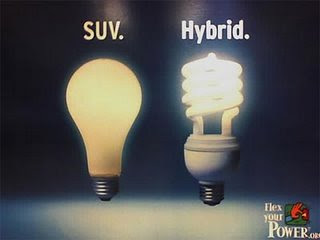 - Many German auto makers seem worried about moves by GM, Honda and Toyota in the direction of hybrids and plug-in hybrid electric vehicles. This is the solution to all our vehicle needs. When is somebody going to step up (and make a ton of money)? - Friedrich: "We all know what to do…It's nothing magic." - Hermann Meyer, chief rep to EU, Volkswagen: "This was not a presentation which has the backing of Volkswagen…Has he done a crash test to verify this? If he has not made a crash test, he cannot say this." - Porsche AG Chief Executive Wendelin Wiedeking: "This is a business war in Europe…"
- Alan Lloyd, former chairman, CARB: “[Friedrich] 's been a constant source of advice and knowledge…"
- Wolfgang Reitzle, former executive, BMW/CEO, Linde AG: "It would be a shame if Germany were to sleep through a trend in hydrogen technology the way we slept through hybrids…"
- Friedrich: "Fuel cells are just a gimmick to avoid regulation…"
A 240 mg pellet of ammonia borane (AB) storing 0.5 liter of hydrogen. The PNNL scientists are experimenting with a compressed form of a hydrogen solid, in pellet form, that could perhaps be carried safely in a vehicle tank and at acceptable weight and volume to serve as fuel. 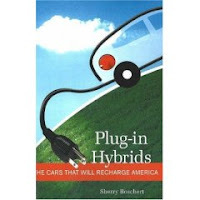 This might solve several of the dilemmas confronting the long-dreamed-of hydrogen highway and its utopian companion, the hydrogen economy. - The hydrogen dream is always just 10 years away. - Research presented by Don Camaioni and Dave Heldebrant of PNNL at 234th American Chemical Society National Meeting, August 21. - The American Chemical Society meeting was in Boston, Mass. - If hydrogen could solve a few daunting problems, it could provide an emission-free, pollution-free source of virtually unlimitied energy. - Aside from the utter waste of using energy to convert hydrogen to usable energy, hydrogen storage and delivery remain unanswered questions to which these pellets might provide answers. - Ammnia borane (AB) is compressed into ¾ gram pellets which store 1.8 liters of hydrogen fuel. 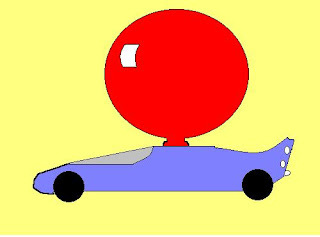 This would bring weight and space consumed in a vehicle lower than pressurized hydrogen gas, allowing performance comparable to current cars. - Experiments are manipulating the release of hydrogen from the pellets and varying temperatures to control the power to fuel cells, mimicking the accelerator in a car. You're always ten years away. - Dave Heldebrant, PNNL scientist: "With this new understanding and our improved methods in working with ammonia borane…we're making positive strides in developing a viable storage medium to provide reliable, environmentally friendly hydrogen power generation for future transportation needs." - Don Camaioni, PNNL scientist: "Once hydrogen from the storage material is depleted, the AB pellets must be safely and efficiently regenerated by way of chemical processing…This 'refueling' method requires chemically digesting or breaking down the solid spent fuel into chemicals that can be recycled back to AB with hydrogen." This is the way it should and eventually will be done. By including the solar system in the overall home price, it adds nothing significant to the monthly mortgage fee yet saves society a bundle in fossil fuel emissions and saves the homeowner a bundle in energy costs over the life of the house. Also, embedded in the home’s cost, it is an expense fairly transferred through changes in ownership. 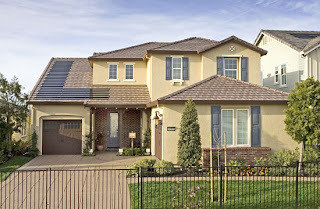 Lennar will make solar energy systems standard on the new homes it builds. It is the largest developer in the region to take the step of making solar systems standard. The solar systems will be installed in designated developments now set for construction. Beginning in the small California cities of Clovis and Reedley in the state’s San Joaquin Valley, the program will be expanded to the developer’s other projects from Tulare to Fresno. - Building 1000 houses/year, Lennar is one of California’s biggest developers. This program will involve 258 houses. - Standard system: 2.3 kilowatt expected to cut grid energy consumption by half. - Installation after construction would cost $15,000 to $20,000. - Buyer gets $2000 one-time tax credit with purchase. Schein: "We have to differentiate ourselves," Schein said. "It is a way to give back to the environment we change by putting new homes on it." Ohio is about to fight the good fight for New Energy. It wants to be the 26th state to seize to the future. By the way, it seems to NewEnergyNews that many have decided it is time to do away with the awkward phrase "Renewable Portfolio Standard" and its confusing acronym, RPS, in favor of the more precise and recognizable "Renewable Electricity Standard" and RES. This is a good idea. Pass it on. Environment Ohio contends that a legislatively-mandated requirement for Ohio’s utilities to obtain a minimum portion of electricity from renewables, called a Renewable Electricity Standard (RES) or a Renewable Portfolio Standard (RPS), would act as an incentive to energy and economic development and potential rejuvenation for the state. 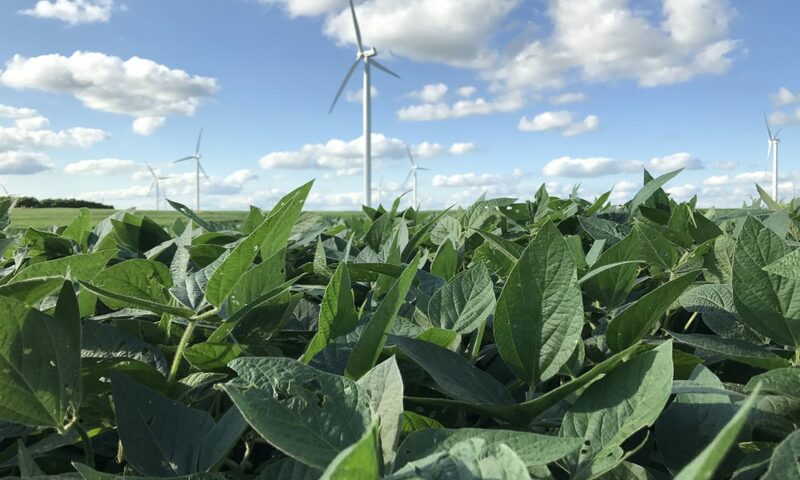 Rising national political and marketplace interest in New Energy is pushing this issue forward in Ohio, especially spurred by Ohio’s large potential wind energy resource. Opponents argue legislators must first attend to the fact that electricity is scheduled to be deregulated in Ohio as of January 1, 2009. The story is from Columbus, Ohio’s state capital. - Ohio is rich in wind resources and does not need to be dependent on dirty coal-burning power plants. - Many northeastern and Midwestern manufacturing centers have suffered economic losses to globalization. If the legislature were to require utilities to obtain their electricity from renewables, rate payers would be financing local installations, local work and all the local economic development that comes with active industry and employment. - 25 states now have some kind of RES. Without this kind of legislation, Ohio’s economy will be without the incentive it needs to remain competitive. 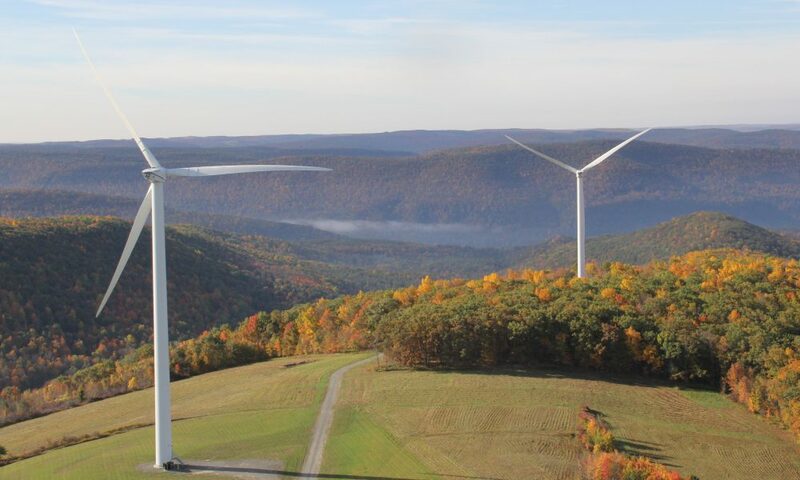 - Environment Ohio called for the legislation requiring the states electricity portfolio to include 20% renewable sources by 2020 to create 3,100 new full-time jobs and dramatically reduce greenhouse gas (GHG) emissions. - Shanahan says Gov. Strickland favors the idea. Republicans in the legislature and aggressive Ohio Manufacturers Association and utility company lobbyists are working against it. Tim Burga, chief of staff, Ohio AFL-CIO: "We believe this to be a great opportunity to put politics aside, not only to address electric restructuring and regulation but also advanced energy…"
Fossil fuel advocates argue that renewables alone cannot power the nation. 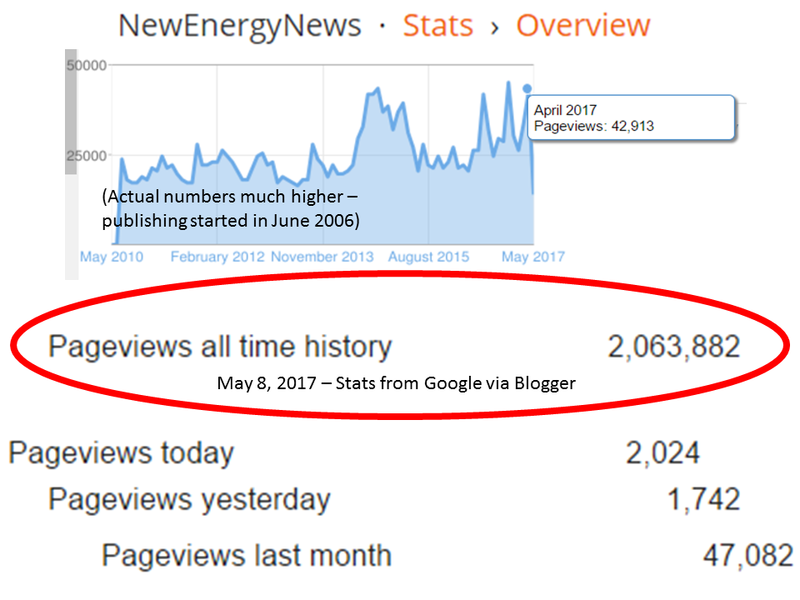 NewEnergyNews says you don’t know what renewables can do until you stop subsidizing fossil fuels and get behind New Energy. For more current map, click here. Goals to obtain designated portions of their electricity are being set by more and more states and congress will consider a national Renewable Electricity Standard (RES) next month. This presents new opportunities and new challenges for New Energy. - The states’ goals vary. Some standards come due as early as 2010. Others reach out as far as 2020 or 2025. Some states’ standards include annual targets. - The bill passed by the House of Representatives in July called for U.S. private utilities to obtain 15% of their electricity from renewable sources by 2020. It will not become law or have a final form until it works its way through a conference process with the Senate and is signed into law by President Bush, who opposes to the idea. - Washington, New Hampshire and Oregon passed their standards last year. North Carolina passed its law this month. - 25 states and the District of Columbia have standards. Illinois, Virginia and Missouri have non-binding goals. - The states set differing goals and define “renewables” differently. Example: The North Carolina law requires utilities to produce 7.5% of electricity from renewable energies by 2021 + meet 5% of demand with more renewables or efficiency reductions allows home energy bill increases of up to $34/year. - The effect on utility rate costs is undetermined. Example: NC utilities predict $1 billion in rate increases through 2017 but others hundreds of millions in savings instead. - Texas, with enormous renewable resources, quickly met the standard it set in 1999 and upped its standard to 5% by 2015. - Some states are not so blessed with abundant renewable sources and even states with standards may not meet them. California is not likely to meet its 20% by 2010 goal. Massachusetts companies only met the 2005 interim 2% goal by paying the state. - Even some environmentalists debate what types of renewables are acceptable and whether politicians should be meddling with energy development and argue that political deals often only get by lobbyist-influenced legislators because they have hidden clauses that are counter-productive. - Fossil fuel advocates argue that renewables alone cannot power the nation. - Dave Hollister, co-founder, Sundance Power Systems (Mars Hill, N.C.): "We're seeing a dramatic upswing in the interest in renewable energy from the general public…Ultimately what's going to happen is if the utilities don't do it, the people are going to do it anyway and the utilities are going to be left on the sideline." - Oregon state Sen. Brad Avakian (D): "We had wind- and solar- and wave-power industries contacting us, champing at the bit to get here…and I just have no question this is going to be a great new industry for the state." - Richard Fireman, environmentalist/ regional director, North Carolina Interfaith Power and Light: "We're under a time constraint here before we pass several tipping points that are going to prevent us from really mitigating climate change…"
- Paige Sheehan, spokeswoman, Duke Energy: "We will never be able to generate all the power that we need with just renewables…"
In addition to the maps and information below, see this web page and map for more information on states' intiatives against climage change. Led by Arnold, the Western Climate Initiative (WCI) states and provinces agreed to cut greenhouse gas (GHG) emissions 15% below 2005 levels and agreed to form a market-based cap-and-trade system. Agreement August 22 for 2020 goal of 15% reduction from 2005 levels. Agreement to develop emissions trading system by August 31, 2008. - WCI: Arizona, California, New Mexico, Oregon, Washington and Utah in the U.S.; Manitoba and British Columbia in Canada. Oil-and-gas-rich Alberta is notably absent. New Jersey and Florida recently announced the goal of cutting emissions 80% by 2050. 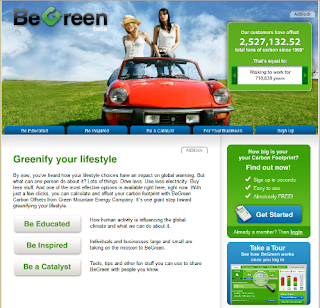 - GHG emissions are widely recognized as causative in global climate change. 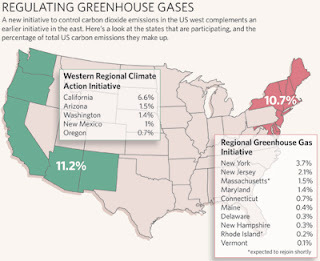 - 10 eastern states formed the Regional Greenhouse Gas Initiative pact in 2003 to cut power plant emissions starting in 2009. - Schwarzenegger: "Our collective commitment will build a successful regional system to be linked with other efforts across the nation and eventually the world…"
- John Coequyt, energy policy analyst, Greenpeace: "These targets are barely consistent with what needs to be done…"
Like Japan, the Brits realize big change can only happen fast enough to impact climate change soon through government leadership and initiative. A government “guidance” to be published later this year will obligate local governments to require all new home developments to generate renewable energy and obtain 50-100% of electricity from renewable sources. Prime Minister Brown’s announced goal is to make all new homes “zero-carbon” by 2016. He also wants Britain to obtain 20% of its electricity from renewables by 2020. - The present Merton Rule (originated in the London borough of Merton and adopted by 150 localities) obligates town councils to require new commercial buildings to get 10% of electricity from renewables. - The House Builders Federation has been fighting the extension of the Merton Rule to residences and wants a 10-year implementation plan to avoid confusion and increased costs. 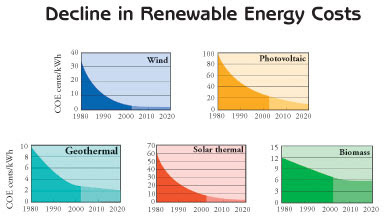 - The renewables industry favors the “guidance” even more than carbon reduction initiatives. - Whitehall Source: Prime Minister Brown’s government plans to “"widen, not abolish [the Merton Rule]…In some instances, we want to see councils going way beyond 10 per cent…The rule is not ours to abolish. We want a wider use of renewable energy, for housing as well as commercial buildings." 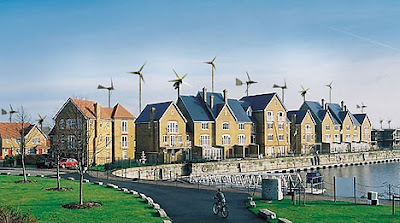 - Department of Communities and Local Government spokesman: "Councils will be required to deliver more ambitious carbon-saving measures and set tougher targets for renewable energy for new developments…"
- Tariq Ahmad, Merton council member for the environment: "We would strongly urge the Government to continue letting councils implement renewable energy policy at a local level." If part of the secret comes from following the money, then these are some of the guys to follow. Four entrepreneurs: Bruce Khouri, co-founder, Solar Integrated Technologies; Pedro Moura Costa, co-founder, EcoSecurities; David Scaysbrook, founder, Novera Energy; Neil Eckert, ceo, Climate Exchange. The 4 entrepreneurs discuss strategies for growing wealth with renewable energies and clean technologies in a carbon-constrained world facing climate change. These men are making big money now, even as changes in energy and markets play out. Khouri founded his company in 2001. Moura Costa jumped into the emissions market after the 1997 Kyoto accords. Scaysbrook became wealthy when he sold wind energy and landfill gas investments in 1998. 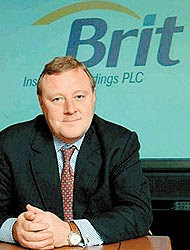 Eckert cashed in his shares of Brit Insurance in 2005 to get into the emissions markets. Solar Integrated Technologies is in Los Angeles. 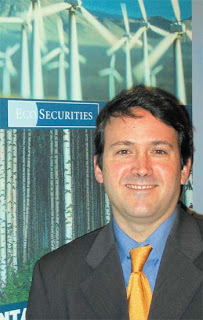 EcoSecurities is based in Oxford, England. Novera Energy is in London. The Climate Exchange is based in Chicago and trades in the European market as well. - Khouri foresaw the value of flexible solar panels as roofing material. He predicts that all roofing material will be solar panels in 20 years and all building materials will be solar energy-producing in 50 years. - Moura Costa was working as a forester when he foresaw the value of carbon credits in a Kyoto Protocols system. He predicts the emissions trading markets will expand because he sees climate change as serious and getting worse. - Scaysbrook sees 3 factors driving the value of renewable energy: (1) energy security concerns, (2) fossil fuel costs, and (3) subsidies, tax incentives and emissions caps. - Eckert sees the emissions markets as an opportunity to replace fossil fuel dependence by creating a financial alternative. - Khouri: "It hasn't been easy but we transformed an old-world roofing material into a renewable energy technology. It's a miracle Solar Integrated is still here but a pioneer charging across the prairie is bound to get hit by a few arrows." - Moura Costa: “It's become quite obvious we do something now or it will be an irreversible trend with catastrophic consequences. The only chance of it being a bubble is if we lack the political commitment to drive emission reductions worldwide…I think it's very unlikely political support will go away." - Eckert: "I believe we have a chance to meet the stated mitigation targets much quicker than people think ... but it depends on whether people believe money can be made." For all of Greenpeace's noble efforts (as described in this post), the ASEAN ministers subsequently joined to formally explore the possibilites of nuclear energy. Will we look back someday and see Greenpeace, like Churchill in the 30s, screaming prescient warnings to deaf ears? Greenpeace estimates a shift by ASEAN to renewable energies from fossil fuels will save $80 billion/year and $2 trillion over 23 years, as well as dramatically lowering greenhouse gas (GHG) emissions. - Greenpeace reported thses calculations August 23, ahead of the ASEAN foreign ministers meeting opening the next day. - The Greenpeace report estimated growth and consumption patterns through 2030. 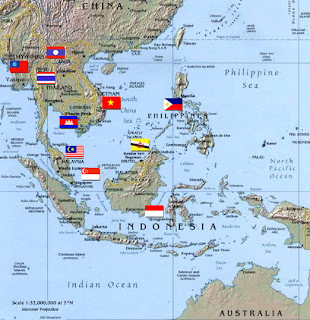 The report was presented in Singapore, where the ASEAN meeting is. - Renewable energies mentioned included wind, solar, geothermal, hydro, biomass and biofuels. - The Greenpeace report offered a global estimate of $180 billion/year in savings and a 50% reduction in GHG emissions by 2030. - Energy ministers and officials from China, Japan and South Korea met with Greenpeace after the report and said the shift would be difficult because economic growth would drive demand for fossil fuels and encourage interest in nuclear energy. Greenpeace called for a moratorium on the building of coal-fired power plants, ignore nuclear energy and focus on renewables. 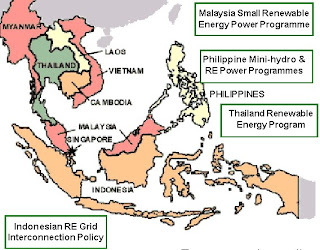 - ASEAN have committed to obtain 10% of electricity from renewables by 2010. In an email to NewEnergyNews, a source close to this story said the Russian central government’s move had to be seen as part of a pattern of using state authority to take control of the country’s resources. The court ruled that control of 6 energy companies in theoil-rich Russian province of Bashkortostan (a lesser-known but nevertheless resource-rich “stan”) must be handed over to the central government. 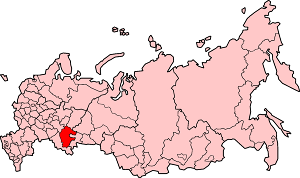 Bashkortostan is in south-central Russia, between the Volga River and the Ural Mountains, east of Moscow and north of the Caspain Sea. - The court ruled in separate lawsuits against Agidel-Invest, Inzer-Invest, Yuryuzan-Invest, and Ural-Invest. They collectively owned oil producer Bashneft (24,000 bpd), refineries Novoil, Ufimsky, Ufaorgsintez, and Ufaneftekhim, and fuel retailer Bashkirnefteproduct. The Bashkortostan government controlled all the companies so that the court rulings essentially constituted a move by the feds against the state. The state will appeal to a higher court. - The Russian federal government has before used tax and environmental regulations as excuses for disruptions in anticipation of resource takeovers. Both Royal Dutch Shell PLC and BP PLC had to cede control of major projects to state-owned energy entities. - State-controlled energy giant Rosneft, or a subsidiary,is expected to wind up with control of the Bashkortostan resources. This is foreign investment in Bashkortostan. Think they found something of value there lately?